It's time for spring cleaning once again. Unfortunately, it's easy to spend a lot of money as you buy all the different cleaning supplies you need. There's no need to worry because we have gathered some money-saving tips for spring cleaning. 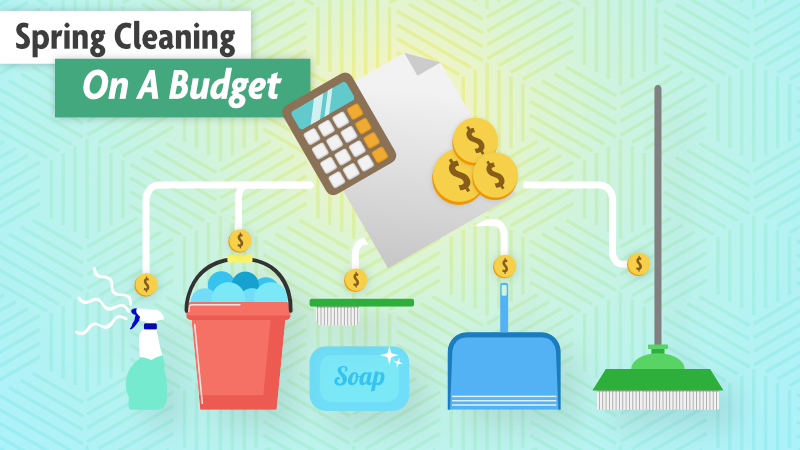 Here are some ways to stick to your budget as you spring clean! You can also check out our section of Spring Savings to find applicable deals. Dusting spray: In a spray bottle, mix 1 cup of water, 1/2 cup of vinegar, 2 tablespoons of olive oil, a few drops of cedarwood essential oil, and a few drops of lemon essential oil. Tile floor cleaner: In a bucket, mix 1 gallon of water, 1/4 cup of white vinegar, and a small amount of dish soap. All-purpose bathroom cleaner: In a spray bottle, mix 2 cups of water, 1 tablespoon of baking soda, 2 tablespoons of castile soap, and 30 drops of tea tree oil. Reuse old t-shirts instead of paper towels: The cost of paper towels can add up, especially if you're doing a deep clean of your entire home. To be kinder to the environment and your wallet, use old t-shirts instead. These work well as dust rags and on other surfaces too. If you're crafty, you can cut a t-shirt into square pieces and sew three together in a stack. This can then be used as a dish rag. Use cold water: As you run loads of laundry while cleaning, stick to cold water. It does the job while lowering the water bills. If you're washing linens after someone has been sick, you can use hot water. The rest of the time, cold water does the job, is gentler on your clothes, and saves you money. As you can see, there are ways to save money as you do your spring cleaning. Try a combination of these suggestions to help you to stick to your budget as much as possible. Your home will be in great shape in no time. By using these guidelines, you can save money along the way.